Opening hours: Most shops are generally open between 09.00 to 19.00/20.00, seven days a week however it can be limited opening hours during the winter months. This monastery dates back to 1301, and it was built by the citizens of Dubrovnik who were ordered to work on it by the local authorities. The attached museum contains an impressive selection of arts from sixteenth-century Dubrovnik including votive jewellery, relics, manuscripts, valuable documents and much more. The best views of Dubrovnik and the surrounding area are, without doubt, experienced from the top of the Srd Hill. 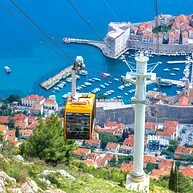 The Dubrovnik Cable Car was built back in 1969 and was eagerly used by millions of visitors who wanted to enjoy the most stunning panoramic views. On a clear day, you can see up to 60 km (37 miles). For this reason, the neighbouring Imperial Fortress was strategically built on this privileged spot, back in the early 19th century. 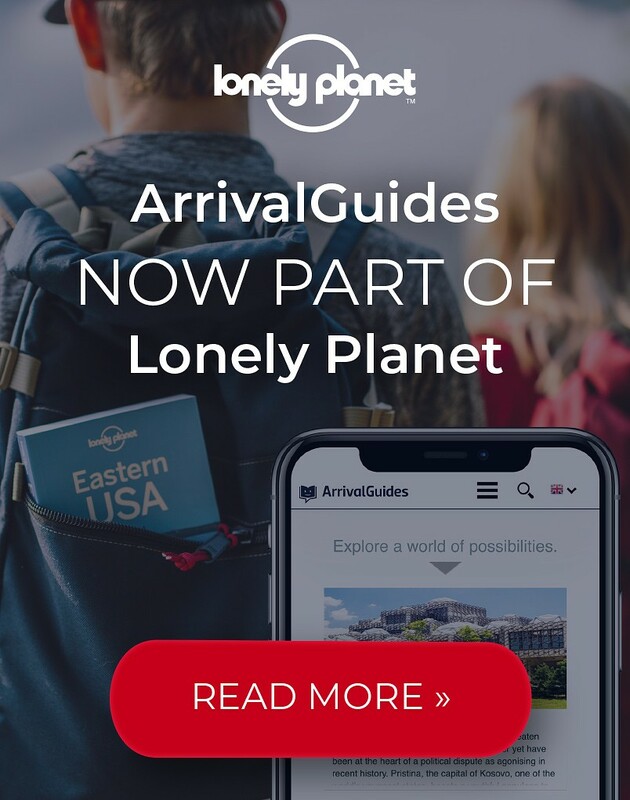 It is also possible to get there by car or walking. No matter how you get there, a fantastic view is your reward! Near Dubrovnik there is the archipelago of thirteen larger and smaller islands and islets known under the common name of the Elafiti. Among them three inhabited islands are of particular interest. Starting from Dubrovnik westwards these are Kolocep or Kalamota (as it is called by the locals), Lopud and Sipan. These islands, being a nature park, give pleasure to the eyes and soul of every traveller seeking peace and relaxation. On these islands without traffic, surrounded by turquoise blue sea, you can enjoy a walk through the forest paths, rest on sandy and stone beaches, taste fresh seafood in restaurants and taverns. 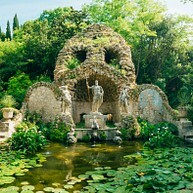 Just outside of town this beautiful Renaissance garden is perched on a hillside overlooking the sea. Palm trees, mandarins and grapefruits grow in this wonderful lush garden together with 400-year-old trees with some reaching heights of 50 metres. Particularly well-worth visiting on a sunny day in spring. Dubrovnik’s baroque Assumption of the Virgin Mary Cathedral was built in the 18th century over the earlier Romanesque Cathedral dating to the 12th century, which was destroyed in the great earthquake of 1667. The Treasury inside the cathedral houses 132 relics of saints dating from the 11th to the 19th centuries. The priceless head, arms and leg relics of St. Blaise that were crafted by Dubrovnik goldsmiths date between the 11th and 12th centuries. Step back into the 16th century and visit a museum the likes of which you have never yet seen. An interesting and modern audio-visual presentation will give visitors the opportunity of becoming familiar with the life and works of the greatest Croatian Renaissance comedian from Dubrovnik, Marin Držić. The Ethnographic Museum is located in an old granary dating to the 16th century, where it is possible to see just how much attention the residents of Dubrovnik gave to the storage of grain. The Dubrovnik Republic kept all the state reserves of wheat, barley and millet in deep silos called «Rupe», carved out of stone and coated with a water-proof material that kept the grain at a temperature of 17ºC. 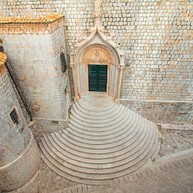 The traditional rural economy and architecture of the Dubrovnik region is found on the First Floor. Folk costumes and textile handiwork can be seen on the 2nd Floor. 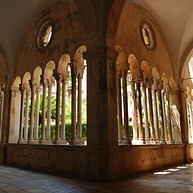 The museum with the inventory from the old «Male Braće» pharmacy dating to 1317 is located in the cloister of the Franciscan monastery. The well-preserved furniture in the pharmacy dates to the 16th century, and the vases are from Sienna and Florence, dating to the 15th and 16th centuries. It also contains various presses, mortars, and an instrument for distilling water dating to the 14th century, as well as prescription manuscripts for making medicine, precise measurement, etc. The Museum is accessible from Celestina Medovića Street. It houses a collection of paintings from the 16th to the 19th century, liturgical items, a 14th century procession cross, two 18th century looms, lacework and embroidery. Most of the exhibits were either votive gifts or manufactured at the convent. A decree made by the government of the Dubrovnik Republic in 1546 allowed Jews to settle within the city ramparts. This officially marks the establishment of the Jewish Ghetto on the street called «Žudioska ulica». In 1652, one of the houses was turned into a Synagogue, whose interior is in the baroque style. It has been preserved to this day, with minor changes, and is one of the oldest synagogues in Europe. The first floor houses a museum with a number of religious artefacts and archive, Rococo, baroque and Louis XVI furniture and paintings by Italian masters. 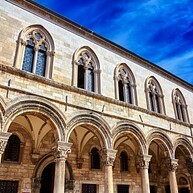 The Cultural History Museum is located in the Rector’s Palace. A court room, dungeon and a scribe’s office are located on the ground floor. A numismatic collection of Dubrovnik coins, seals, weights, and a collection of watches are on the mezzanine level. Beautiful examples of furniture, portraits, uniforms, and an inventory from the Domus Christi pharmacy, as well as various kinds of weapons can also be seen. In only ten minutes a boat from the Old City Harbour will take you to the Island of Lokrum, a special forestry reserve under UNESCO protection. A favourite bathing and excursion place in close proximity to the City, Lokrum is also the exotic and mysterious venue of many legends and stories. A small lake on the island called Mrtvo More (Dead Sea) is suitable for children and non-swimmers. Walk to the highest point of Lokrum, the elevation with the star-shaped Fort Royal, built by the French in 1806. 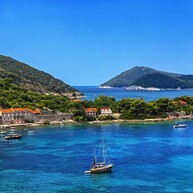 The place offers a magnificent view of the City, Cavtat and the islands. Stunning buildings and a great atmosphere makes the Old Town fantastic to wander around in. The marble-clad streets are some of the most fascinating in the world. 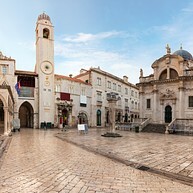 The main street, Stradun, begins with an old monastery and ends in a great square. Throughout the Old Town, you will find plenty of restaurants, cafés and souvenir shops. The Maritime Museum is located on the First and Second Floors of Fort St. John’s.The exhibits on the First Floor give an overview of the development of Dubrovnik maritime trade and shipbuilding from its very start to the fall of the Dubrovnik Republic. 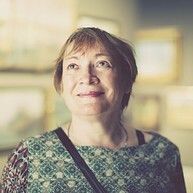 The exhibits on the Second Floor show the resurgence of maritime trade in Dubrovnik and on the Pelješac Peninsula during the 19th century, as well as the strength of Dubrovnik steamships up until World War II and afterwards. 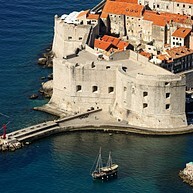 The whole of the Old Town in Dubrovnik is surrounded by the city walls which served as a defence against attack from the sea. The wall stretches nearly two kilometres and is as high as 25 meters in some places. A walk on the walls provides the ideal opportunity to enjoy the medieval and baroque splendours of the Old Town. 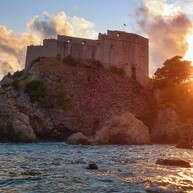 This tour will not only take you to amazing sets that are used in the popular HBO's Game of Thrones, but also give you a better insight about the history of Dubrovnik. The very professional and entertaining guides will share some great insights and stories about the filming and production of the show. With a small group of max nine people, this tour will give you a more in-depth and personal experience and it is not only highly appreciated tour among the Game of Thrones fans but also for those who have never seen the show.